(HSDWellnessNews) While vaccine makers and drug companies are rushing to bring medical interventions to the market that might address the Ebola pandemic, there’s already a technology available right now that can kill Ebola in just two minutes in hospitals, quarantine centers, commercial offices and even public schools. 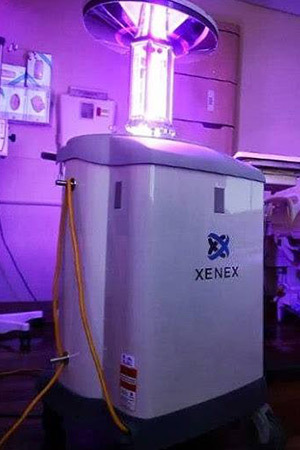 The base price of the Xenex unit is around USD$100,000, and the unit pays for itself very quickly by preventing expensive infections. It can disinfect a typical hospital room in about 10 minutes, and it comes with organization and scheduling software that allows hospital staff to keep track of which rooms have been treated. I recommend you demand your Hospital buys one of these Now.